By 1990, image makeovers were not unusual - plenty of stars had traded in their tired old look for a shiny new veneer during the '80s. But this week that year, a male singer who'd become one of the most recognisable faces of the previous decade made a decision about his public image that few would've seen coming. After bouncing around in frothy, fluorescent music videos in the mid-'80s and upping the raunch factor later in the decade, the singer in question made a bold move and stepped out of the spotlight. He still released music, but he did so without participating in its visual representation almost entirely. A band whose flopping fish-out-of-water visual was causing quite a stir held on to the number 1 spot this week in 1990. "Epic" by Faith No More spent a second week on top. Their second consecutive - and final - top 10 hit in the UK, this sample-heavy follow-up to "Dub Be Good To Me" didn't catch on in Australia. While Australia's interest in MOR legends Chicago ended with Peter Cetera's time as singer in the mid-'80s, America continued to award them top 10 hits until 1989. But this Days Of Thunder soundtrack single flopped there, too. Although they started their career with two perfectly formed pop nuggets in "Wishing I Was Lucky" and "Sweet Little Mystery", Wet Wet Wet soon devolved into housewife-pleasing balladeers. And while that threw up some perfectly pleasant hits like "Sweet Surrender" (which had just fallen out of the top 100), it also led to a string of forgettable down-tempo singles. Two of those ("Broke Away" and "Hold Back The River") were skipped over in Australia, where the Wets' record company opted instead for return to form "Stay With Me Heartache", which lost its bracketed subtitle "Can't Stand The Night" for single release. Included as a double A-side on the single was a remake of The Beatles' "I Feel Fine", which the band had performed at the all-star John Lennon tribute concert held in May. It was the second cover of a Fab Four song recorded by Wet Wet Wet, following their UK chart-topping version of "With A Little Help From My Friends" in 1988. More to the point: who did Collette think she was? Certainly not Yazz anymore, even if she had gone and lopped all her hair off. But gone were the bike shorts and the budget house production - instead, "Who Do You Think You Are" sounded like an attempt to emulate the pop/R&B sound of Paula Abdul or Pebbles. This time, the musical imitation didn't work. After managing a surprising amount of top 50 appearances with singles from her first album, this lead release from second LP Attitude failed to connect - even though I thought it was actually her best effort yet. Around this time, I remember seeing Collette perform on some telethon or other - and by "perform", I mean jig about while she lip-synced to this song (although it may have been next single "Upside Down"). Unfortunately for her, the record skipped - and in a post-Milli Vanilli world, that was just about the biggest mistake a pop act could make. Combined with her decreased sales, oblivion beckoned. On one of the music websites I frequent, there was a discussion recently about songs that include references to other songs in their lyrics. This follow-up to "Step By Step" is a case in point, with the New Kids alluding to "Please Don't Go Girl", "I'll Be Loving You (Forever)", "Hangin' Tough" and "You Got It (The Right Stuff)" in the first verse. Self-referential lyrics aside, the tempo-shifting "Tonight" made it two great singles in a row for the American boy band, although its number 16 peak suggested their fans were already moving on to the next big thing. Number 38 "Ooops Up" by Snap! Just as Beats International had reworked seminal funk hit "Just Be Good To Me", so too did Snap! have their way with The Gap Band's classic "Oops Up Side Your Head" (a UK top 10 hit in 1980). Retaining only a portion of the original song, "Ooops Up" was fleshed out with a rap from Turbo B and vocals from Penny Ford, who actually got to appear in the music video this time and, interestingly, had once been a backing singer for The Gap Band. The result: an even bigger hit than "The Power", as "Ooops Up" stormed into the top 5. Most bands are lucky to get one shot at success, but Cheap Trick were still in the throes of their second life as chart stars, which had been kickstarted by 1988's "The Flame" and the Lap Of Luxury album. The band kept the ball rolling with this lead single from Busted, a song that they'd originally offered to Rod Stewart - and while it would give them another hit, it'd be their final major chart appearance in both Australia and the US. Proving that you're only as profitable as your last hit, record label Epic Records dropped the band after two follow-up singles failed to ignite. And so began George Michael's shunning of everything that had made him a superstar in the first place. This lead single from Listen Without Prejudice Vol. 1 was as far removed from the likes of "Wake Me Up Before You Go-Go" or "Faith" as you could get - and although he'd released ballads before, the lyrical content of "Praying For Time" was a new direction for the suddenly camera-shy singer. In early Wham! singles, George had dealt with social concerns like youth unemployment and the generation gap - but never like this. With its sombre tone and a complete lack of the effervescence heard on songs like "Wham Rap! (Enjoy What You Do)", "Praying For Time" painted a serious picture for listeners of a society riddled with injustice, selfishness and poverty. Faced with a star who refused to appear in any more music videos, George's record label released what would now be called a lyric video for "Praying For Time" - a decision which ended up being quite an effective way of reinforcing the serious subject matter of the song and making people pay attention to the words. Despite a satisfactory result being achieved on this occasion, little did anyone know just how significant that antagonism between artist and record company would become. 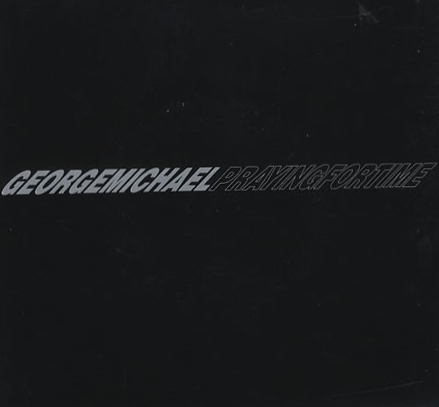 While George Michael went in new directions, fellow male superstar Prince revisited old songs and projects in 1990 with the Graffiti Bridge soundtrack and the accompanying film. A sequel to Purple Rain, the movie that'd cemented his superstar status in 1984, Grafitti Bridge picked up with Prince's character, The Kid, now a part-owner of club Glam Slam. The soundtrack's lead single, "Thieves In The Temple" might have been a brand new track - the final one recorded for the movie - but many of the other songs dated back years to sessions for previous albums. And like on the Purple Rain album, Prince wasn't the only featured performer - with a young Tevin Campbell among the other vocalists. 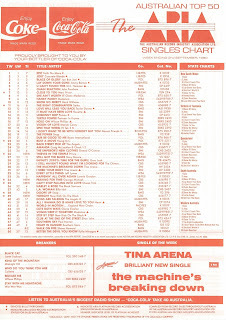 Like "Praying For Time", "Thieves In The Temple" was received with some uncertainty in Australia despite being a brand new song, peaking outside the top 10 at number 16 - a disappointing achievement for an artist of Prince's (musical, if not physical) stature. Meanwhile, Grafitti Bridge the film didn't have anywhere near as positive a reception as Purple Rain, being nominated for a handful of Razzie Awards. Next week: one of the biggest new acts from 30 years ago returns to the chart 25 years ago. Plus, the latest artist to reach the top 50 with a megamix, and new singles from Midnight Oil and The Traveling Wilburys. 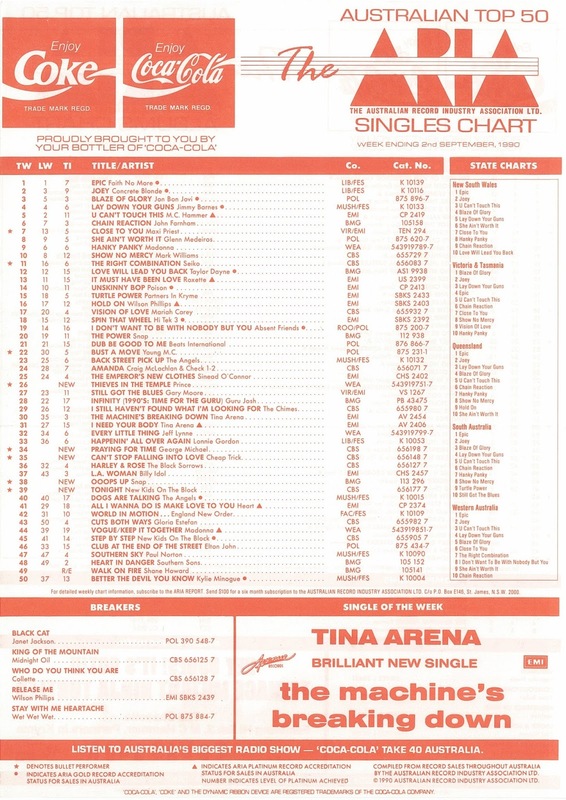 It was this week in 1990 that rage switched from a top 50 to a top 60, and continued to do so for the next 3 and a half years (minus a 3 month stint in 1991 when it reverted back to a top 50), due to having an extra hour of air time. Not being aware that the full top 100 was available by subscription, I was thrilled to finally have some beyond-50 chart data. I bought the Beats International single on cassette, though it probably wasn't as good as 'Dub Be Good To Me'. I don't think I've ever heard 'Hearts In Trouble' before. I also bought Collette's 'Who Do You Think You Are'; my sole Collette purchase. The price for cassingles had gone up a whole dollar (~25%) to $4.99 by now, which was quite extortionate considering that's $9.21 in 2014 money. She copped so much flack for 'Ring My Bell'... the radical image change and lyrical theme were quite a shock. I hated 'Tonight' then, but it has grown on me since. It was a questionable idea to sing a song just to their 'girl' fans, even if they probably comprised 99% of their fan-base. I see the logo on Donnie's Adidas t-shirt is pixelated out in the video by Vevo, and if I remember correctly, rage did the same (with it being against the ABC's policy of promoting commercial brands). The song is very Beatles-esque. 'Ooops Up' was yet another single I bought from this week's entries. I love the 'mouse stepped on' (as someone put it in a magazine review I read) noise throughout, and the unusual lyrical themes. Love the 'hard as Chinese math' lyric and Little Miss Muffet references. It seems stange that this peaked higher than 'The Power' in Oz. The Cheap Trick song is very average. It seems strange that their record label dropped them after this album, as it provided one moderate hit. The 'lyric' video for 'Praying For Time' didn't debut - at least not on rage - until several weeks into its chart run. I recall later seeing a video of George performing the song in a studio (virtually identical to the 'Waiting For That Day' video). I assume the American branch of the record company forced/coaxed him into doing those videos. Including 'Volume 1' in the album's title was surely tempting fate, as Volume 2 has never surfaced. 'Thieves In the Temple' seemed to me at the time liked just another run-of-the-mill Prince song, but in retrospect it's one that I remember/like more than many of the others. I should have mentioned this because I noticed it when I watched the Tonight clip again - but I'm pretty sure it was a picture of a marijuana leaf made to look like the Adidas logo on Donnie's t-shirt, so the pixelating was because it was deemed too controversial.